As transportation becomes more and more important, we are all looking for a better method to get around. Cars are not only bad for the environment, but they can also cause a real hassle when dealing with lots of traffic. It seems like people who walk or cycle to work sometimes get there quicker than people in a car! With all of this problem, there has to be a better solution for inner-city transportation. Luckily, Razor invented the EcoSmart Metro Electric Scooter. This scooter gets you from place to place without using a drop of gasoline. They’re known to be much better for the environment. Not only that but they also have a pretty great overall speed and battery life. It’s important to not sacrifice too much because you don’t want the ride to work to become any more inconvenient! With the rise in popularity of electric scooters, the EcoSmart Metro scooter shines above most of the competition. Razor has always been known as the number one producer of scooters for their high level of quality and overall craftsmanship. That level of dedication is shown once again in this model, which is why we’re happy to have all the details. Instead of making you do all the research yourself, we’ve compiled all the knowledge we’ve gotten from reviews, articles, and videos to bring the most important features to the table. We know that nobody likes to read all the boring mumbo-jumbo in between, so we wanted to weed out the boring stuff and bring you all the exciting details! If you’re looking for a new method of transportation, or you’re simply interested in electric scooters, read on! When most of us think about scooters, we usually imagine standing up and pedaling. 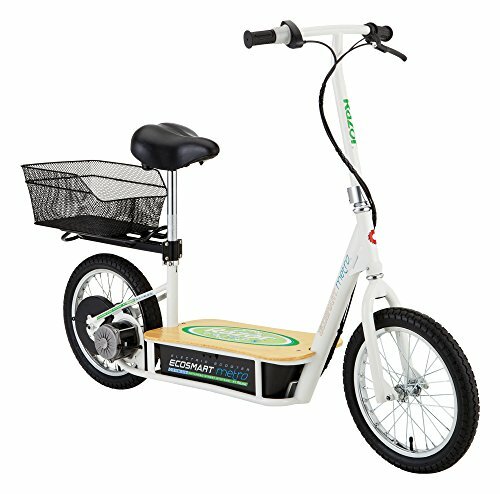 The great thing about the EcoSmart Metro Electric Scooter is that it’s a seated scooter. It’s the ultimate comfort combined with a reasonable seating arrangement. It’s kind of hard to convince someone that pedaling all the way to work is good for the environment because most people don’t want to get all sweaty on their way to work. However, being seated on an electrically powered scooter changes the game! It’s always important to have a comfortable ride around, but equally as important is the durability. There’s no point in buying a product if it can’t flex or breaks after a few uses. Some other electric scooters can’t carry very much weight, while others slowly deteriorate over the course of a couple years due to rain and weather damage. You wouldn’t want to invest in a new method of transportation just to lose it in a couple of years, would you? Fortunately, the Razor EcoSmart scooter is made out of bamboo. Bamboo is not only one of the most durable woods in the world, but it’s also great for flexing. You want the deck of your scooter to flex at least a little bit for the same reason that a car needs suspension. If too much weight goes on it, it’ll simply underperform instead of breaking in half or cracking. Bamboo is great to prevent both of these from happening, protecting your comfort as well as your investment. One of the first things people look at when they’re purchasing any electric vehicles is that speed and battery life. Without a good battery, what’s the point of buying it? You wouldn’t want to have to keep recharging it all day! It would almost be enough to make you want to go back to using gasoline vehicles, which is the opposite of what you’re trying to accomplish with this product. The battery has to be long-lasting enough to bring you to your destination and back without stressing you out, and that’s exactly how the EcoSmart Metro scooter works. The battery on this electric scooter lasts for up to 40 minutes of continuous riding. Keep in mind that this number is continuous, which means it doesn’t include stops, slowing down, and speeding up. It’s counting max speed, full force, 100% of the time until it stops working. Realistically you’re looking at about an hour to an hour and 15 minutes on a single charge if you’re stopping and slowing down a lot for traffic or stop signs and stop lights. The motor on this scooter is another focal point that doesn’t fail to impress. Accelerating up to 18 miles per hour, you’ll have no problem getting where you need to be on time. While many other electric scooters only get up to between 10 and 12 miles per hour, this one shatters those limitations. 18 miles per hour is almost as fast as a car’s speed limit within a city, which makes the EcoSmart Metro Scooter even more worth using as an alternative to driving a car. Although they’re not as fun to read about, safety features are without a doubt the most important feature to know about an electric scooter. With all kinds of fragile materials and rusting metal, there are too many bad products out there to not keep an eye on. You want to always make sure that the product you’re buying meets the safety standards that you have set for yourself, and we’re pretty sure the Razor EcoSmart Metro scooter will do that just fine. The bamboo wood we mention is not only good for flexibility and durability, but it’s also very important for safety purposes. Having a deck that doesn’t splinter or cracks is very important because if either of those things happens, it can cause some serious injuries. Luckily, this deck is made out of bamboo, which saves you from any problems down the road. It’s also made with a steel frame, which won’t rust or whither away from weather damage. The scooter itself weighs in at 67 pounds, while it allows for a weight capacity of 220 pounds. This is more than enough for most adults, and it’s also far higher of a limit than a lot of the other brands. They’ll usually set the weight limit at around 150 to 180 pounds, which cuts out a massive amount of potential riders. Bamboo and steel are incredibly strong, which is why the weight limit on this electric scooter is much better than other models. + Made of bamboo and steel, this electric scooter is more than durable enough to deal with any and all situations that you might come across when riding around your town. Durability is just as important as the rest of the details since it’s a major factor in how long your scooter lasts. + The maximum speed of 18 miles per hour is more than enough to get you where you’re trying to go in a timely manner. You wouldn’t want to get an electric scooter just to be late to work, would you? The speed is this scooter is much better than most other models, which makes it one of the best around. + Safety isn’t always the most fun thing to talk about, but we all know it’s very important to make sure that your ride is as safe as it needs to be. The materials used in the making of this scooter combined with the handlebar braking system make this a very safe scooter that you won’t have to worry much about. 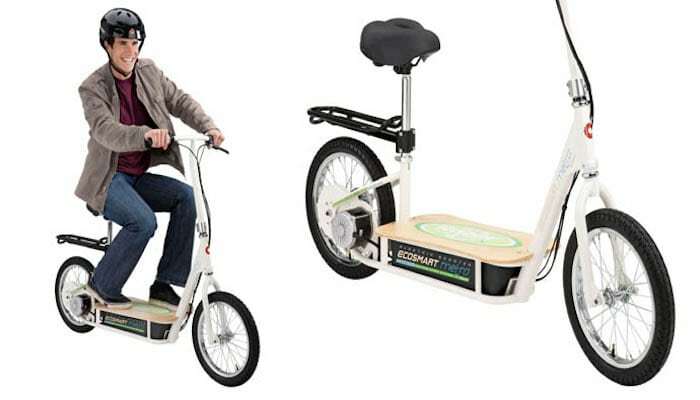 + This scooter supports up to 220 pounds which is better than most of the competition. The great part about this feature is that the scooter only weight 67 pounds since its deck is made out of lightweight bamboo so it’s not too heavy to carry around if you have to. – 18 miles per hour isn’t the fastest in the electric scooter industry, but it’s certainly not the slowest. That being said, some people prefer a higher top speed so they can take their time getting ready in the morning. – The 40-minute battery life might be the only complaint that a lot of users have. If your work is within 20 minutes, then you probably won’t have any problems with these limitations. Even if it’s 40 minutes away, you can still quickly charge the EcoSmart Metro at work and then be fully charged by the time you’re ready to go home. The Razor EcoSmart Metro Electric Scooter is smart for anyone looking for an alternative method to get to and from work, school, or any other inner-city errand that they might have. It’s very reliable and features a great top speed to help you get to wherever you’re going in a timely fashion. We like the EcoSmart Metro scooter for what’s in its name: ‘Eco’. Not many vehicle producers look after the environment, but Razor does an excellent job at being environmentally conscious while still providing an excellent and reasonable method of getting around town without polluting the world around you. If you’re an eco-friendly person and you’re looking to replace your car for smaller trips, then the Razor EcoSmart Metro Electric Scooter is absolutely worth checking out!